Let us provide your employees or clients with clean, refreshing, 100% spring water. Bottled right here within Western New York by Mayer Brothers, our water is of the highest quality. You can relax knowing that you are getting great tasting, all natural spring water that comes from the natural spring filters in our area! So that we can meet your water needs, we have a couple different setups which use traditional 5 gallon bottles. Our more basic and affordable coolers come with cold and "cook" cold faucets. These are an affordable option at only $10/month and are great for a chilled glass of water or quick access to room temperature water for other uses. The other option that we have available for you is a hot/cold water unit. These come fitted with a traditional cooling unit, plus a hot water tank, perfect for cocoa or teas. A monthly lease for the hot/cold is $14/month. Going "green," or going through a lot of water and would like to find better use of your storage space? If you're looking for a higher volume water cooler and want to skip the 5 gallon bottles, we can cover that for you, too! Coolers are available that connect directly to a water line and have an external filter which only needs to be changed annually. No water bottle costs or deposits, only the $35/month lease. Better for you and the environment. Fewer bottles in landfills and none in your storage area, plus less clutter in your office and your books! If you're looking for distilled water, we can bring it to you. A case of three (3) one-gallon bottles of distilled water costs $3.75. Distilled works well in sensitive equipment and applications in which the presence of minerals is detrimental to the product. It's perfect for dental offices and other locations requiring sterilization equipment. Think of us for your electric forklift battery upkeep. 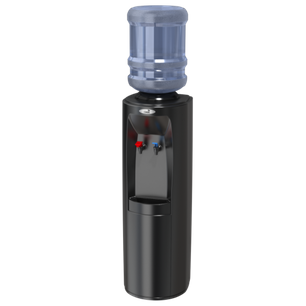 All of our coolers are equipped with a water guard to prevent contamination and allow for easy, no-leak bottle changes. Also, remember that all deliveries are free! For water cooler leases, a monthly fee is charged, but no contract required. You may cancel at any time. There are no minimum orders and delivery is free. Each 5 gallon bottle is $6.75, with your initial purchase also having a $7.00/bottle deposit. There is no deposit on subsequent bottles as you return your empty containers to us. Distilled water only comes in cases of 3 one-gallon bottles. There are no deposits on the 1 gallon bottles.